Armillion has announced the launch of its new “ArmillionAdamantos” contactless payment bracelet, with 252 brilliant-cut diamonds on each side and an increased spending limit of £1 million. The limit is also increasing on existing models. The “Armillion Adamantos” bracelet is a tribute to the success of the 10 people who will have the chance to own it. Adamantos is the etymology of the word “diamond,” which means indomitable, undefeatable; the attitude that will define its owner’s legacy. While they may be sleek and stylish in design, it’s the technology behind Armillion products that’s really impressive. Each bracelet acts as a key to daily life, offering the wearer the convenience of a world totally unlocked – but with strict security measures. The NFC technology behind the Armillion bracelet not only provides bank-level encryption to ensure safety and security, it now also allows for contactless payments of up to £1,000,000 to made anywhere in the world, supported by Mastercard. Upon purchasing a bracelet, the owner is able to link the serial number to their personal ID information, using the Armillion App. Then, they will have access to its balance and movements, be able to turn payments on or off, and increase spending limits where required. Unlike most wearables with frustratingly limited battery lives, Armillion bracelets never need to be charged – they instead use the required energy from the very process of making contactless payments, via card readers. Born in Geneva, a city known for its banking, security and watch-making companies, the idea was simple – Armillion wanted to harness a team of security and FinTech experts to create a beautiful and luxurious product, but also a practical one. 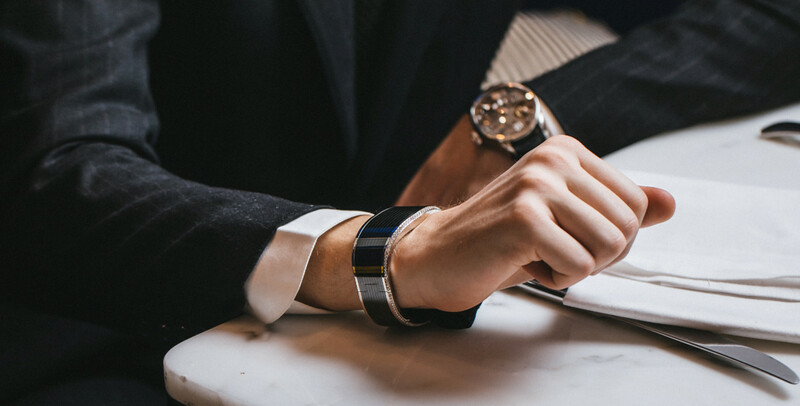 Not only can each bracelet make contactless payments, they can also unlock your supercar and home, and disarm your security system on your approach – no keys needed. Armillion bracelets are made from one of the hardest materials on the earth – High-tech Ceramic – making it virtually scratch resistant;this is usually seen on the bezels of high-end, swiss watches. This exclusive Zirconia OxideCeramic core is made from just two complex solid pieces, each of which takes five days and up to 1500 degrees of heat to create, before they are machined together for 98-hours with diamond-tipped tools to a thousandth of a millimetre for the perfect fit. A further five days of polishing is required, before they achieve the unique ‘black mirror’ finish that will then receive the flawless guilloche engraving. This model embraces the ceramic with a 18K White Gold structure, set with 126 perfectly cut diamonds on each side, totalling 4.6ct. As with the watch industry, a 5-axis milling precision machine creates the micron-tolerance holes in the White Gold surface, according to the different sizes of diamond. After this complex, high-tech procedure, it takes a skilled Gemologist almost 30 hours to set the stones in each piece. Each edition of the Armillion bracelet is limited to 10 pieces available worldwide, including the diamond-set model; the company also provides ‘bespoke’ services for those who would like to create their own design.